HPN M(6) Metabolism Optimization is a product that supports the weight loss process both in the heavy reduction period as well as in less intensive time to control body mass in order to improve the silhouette. This product, by focusing on the optimization of metabolic processes, without repeating the scheme of introducing to the organism powerful stimulants which disrupt its functioning, it effectively supports the process of excess tissue reduction, thus prolonging the duration of obtained effects. Vitamin B12 – a composition of water-soluble cobalamins, also known as coryneoids, compounds containing a centrally located cobalt atom in a molecule, substituted with a suitable substituent. Methylcobalamin (MeB12) is one of the natural forms of vitamin B12 which has high bioavailability and coenzymatic activity, and in structure of which the cobalt has been substituted with a methyl group. By combining with the right glycoprotein allowing for the synthesis of the hematopoiesis factor which enables the formation of blood cells in the hematopoietic system, supporting the reproduction of genetic materials in erythroblasts and allowing the production of blood cells in the bone marrow, it provides the required cardiovascular performance. Acting as a cofactor that activates methionine synthase, which catalyzes the transformation of homocysteine ​​into methionine, it allows to maintain a good state of the cardiovascular system. By enabling the conversion of folic acid into tetrahydrofolate, it supports the stabilization of the genome structure. By normalizing the level of cytokines, supporting the protein and DNA methylation process, increasing the growth of nerve cells and inhibiting neurite apoptosis by affecting the Erk1 / 2 and Akt pathways, it contributes to maintaining a satisfactory nervous system condition and improvement of cognitive abilities. By reducing the proliferation of cancer cells, it limits the rate of cancer processes formation. The level of a this vitamin is negatively correlated with many ailments and BMI (Body Mass Index), due to which its deficiency is considered a risk factor increasing obesity and its consequences. Glucuronolactone – a cyclic ester of glucuronic acid, a glucose derivative occurring extremely abundantly in the natural environment, yet it can also be synthesized in the human organism. Its properties are displayed by its numerous derivatives, including D-glucaro-1,4-lactone (G14L). By reducing the activity of reactive oxygen species, breaking the processes of lipid peroxidation and increasing the concentration of small-molecule thiols, it supports the functioning of the antioxidant barrier. By reducing the release of lysosomal enzymes, thereby stabilizing cell structures and reducing the formation of proinflammatory cytokines, it limits the extent of inflammation.Through participation in the glucuronidation process that allows binding, i. a. xenobiotics, nitrosamines, aromatic amines and polycyclic aromatic hydrocarbons; and by giving them greater polarity that facilitates the removal of toxins along with the bile or urine and minimizing the breakdown of conjugates produced by inhibiting β-glucuronidase (βG), thus increasing the efficiency of outflow of harmful substances, it supports detoxification of the organism. By removing carcinogens through combining with them, preventing premature breakdown of the produced glucuronides by inhibiting β-glucuronidase, normalizing the level of steroid hormones, limiting the binding of carcinogens to DNA, reducing the number of mutations, minimizing the occurrence of phases of: initiation, promotion and progression; inducing apoptosis of abnormally altered cells and suppressing inflammation, it counteracts cancer formation processes. By normalizing the biosynthesis of cholesterol and steroidogenesis, it lowers overall cholesterol and low density lipoprotein (LDL) levels while not affecting the amount of high-density triglycerides and lipoproteins (HDL), thereby helping to optimize the lipid profile. By engaging in improving the lipid profile, reducing lipoprotein oxidation processes and limiting inflammatory processes, it supports maintaining good condition of the circulatory system. By limiting the growth and activity of Helicobacter pylori, it helps to maintain good stomach condition. By blocking β-glucuronidase, it increases the efficiency of the bilirubin conjugation process, thereby preventing its precipitation in the form of calcium salts and the formation of gallstones with its participation. Guarana extract – the extract obtained from the seeds of Paullinia cupana, a plant belonging to the family of bush naturally growing on the Amazon basin. It owes its properties mainly to the high content of caffeine and its combination with tannins which, by delaying its release, balance and prolong the action of the psychostimulant compound. As an important source of caffeine, adenosine receptor antagonists and phosphodiesterase inhibitor, a compound that increases the concentration of numerous neurotransmitters, including adrenaline, noradrenaline, acetylcholine and dopamine, it awakens the organism, improves reaction time and motivates to act as well as accelerates the loss of unnecessary fat tissue by enhancing lipolysis and thermogenesis. Due to the other-than-caffeine substances, it has neuroprotective and anxiety-lowering effects, and thus it minimizes the discomfort caused by the increased supply of caffeine. It minimizes the feeling of pain and migraines. By protecting the endothelial structure from oxidative damage, and by reducing platelet aggregation through limiting the effect of ADP, arachidonic acid and thromboxane, as well as by lowering total cholesterol with simultaneous elimination of low density lipoprotein (LDL) oxidation, it supports the maintenance of good cardiovascular health. By improving the functioning of the antioxidant barrier, including enhancing the activity of superoxide dismutase (SOD), it minimizes damage to genetic material and related tumorigenesis processes. It reduces allergic reactions to certain substances. It has antifungal and antibacterial effects. It exhibits aphrodisiac properties. Anhydrous caffeine – a substance also known as 1,3,7-trimethylxanthine, a dehydrated xanthine derivative substituted with three methyl groups, a commonly synthesized chemical plant alkaloid, naturally occurring, e.g. in seeds of Paulinia guarana and leaves of Ilex paraguariensis and Camellia sinensis, identified mainly with coffee, drink obtained from Coffea beans, evergreen shrubs classified in the Rubiaceae family originating from the tropical zone of Africa and Asia, also cultivated in areas of South America.As an antagonist blocking the conjugation of adenosine with its assigned A1 and A2 receptors, it promotes the formation of numerous neurotransmitters, including epinephrine, norepinephrine, dopamine and acetylcholine. By increasing adrenaline, noradrenaline and cyclic adenosine-3',5'-monophosphate (cAMP) mainly by inhibiting the phosphodiesterase (PDE) which is degrading its structure, it enhances lipolysis, intensifies fatty acid beta-oxidation and limits the re-accumulation of energy substrates in the form of glycogen and adipose tissue. By promoting the synthesis of uncoupling proteins (UCP), it increases thermogenesis, supporting the additional utilization of energy in the form of heat. By increasing the amount of testosterone, it improves the processes of losing excess fat tissue and motivates the organism to undertake the intended activities. By inhibiting protein phosphatase 1 (PP1) it intensifies the signal sent by dopaminergic neurons, improving the mood. By increasing the level of serotonin along with multiplying in the number of its receptors and inhibiting the activity of tryptophan hydroxylase, it reduces the amount of the pain felt. By increasing the concentration of acetylcholine, it improves nerve conduction, memory creation processes and the brain-muscle connection that affects the efficiency of performed activities. By improving the outflow of calcium from the endoplasmic reticulum, it supports muscle contractility. AnthOrigin™ – purple maize shell extract, naturally occurring in the Peruvian Andes. The high content of 3-O-β-D cyaniding glucoside (C3G), a substance belonging to anthocyanins, is largely responsible for its properties. In one study, C3G has reached the top with regard to antioxidant properties (in the ORAC test, out of 13 anthocyanins tested). It also occurs in chokeberry, black lilac and blackcurrant. It affects the raising of glutathione levels, which increases the abilities of antioxidant barrier. It increases the cell viability of brain cells, inhibiting the accumulation of excess calcium in cells. It exhibits the activity that reduces blood sugar levels, reduces the existing state of insulin resistance and promotes proper glucose metabolism. By increasing the translocation of GLUT4 glucose transporter, it improves the utilization of glucose by the muscles, thus limiting its accumulation in the form of spare fat. By lowering cholesterol absorption through the inhibition pancreatic lipase, and by decreasing the micellar solubility of cholesterol as well as limiting cholesterol uptake, it engages in lipid management. By lowering triglycerides, total cholesterol and low density lipoprotein (LDL) levels, it supports the maintenance of optimal lipid profile. It reduces blood pressure and may reduce the symptoms of metabolic syndrome. It supports the regeneration of rhodopsin in the eye, improving vision at night. By stimulating AMPK, affecting PPARγ receptors and creating uncoupling proteins (UCPs), it promotes the release of energy substrates from stored sources, including adipose tissue, enhances their burning and release in the form of heat. By stimulating alkaline phosphatase (ALP) in bones and bone marrow cells, it supports osteogenic processes. 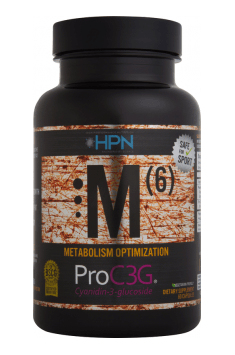 To sum up, HPN M (6) Metabolism Optimization is a product supporting body mass reduction, which does not contain unnecessary, strong stimulants, based on components that are focused on setting the metabolic processes in a way of maintaining the least possible blast structure sources. By increasing the amount of cAMP, stimulating AMP activated kinase, modulating the response of PPARγ receptors and enhancing UCP expression, it promotes the release of energy substrates from accumulated sources, including fats and glycogen, limits their re-accumulation and initiates burning processes and utilization of generated energy, also in the form of heat. By affecting the GLUT4 translocation, it increases the efficiency of glucose uptake by the muscles as an efficient place of its burning. By eliminating the effects of digestive enzymes, it reduces the amount of consumed calories and reduces the level of triglycerides in the plasma. By normalizing the pathways of cholesterol synthesis and metabolism, it improves the lipid profile. By limiting inflammation, including in the reserve fat tissue, it minimizes its susceptibility to excess fat accumulation. By conjugating and removing numerous toxins coming from the burned fat, it prevents the poisoning of the organism and its deregulation. Supporting the maintenance of a good condition of many systems and organs, including bone, vascular, nervous systems or liver, it ensures full satisfaction with the obtained results. HPN M (6) Metabolism Optimization is an extremely effective product supporting body mass control, allowing for fast achievement of the set goal, without causing unfavorable deregulation of the body. M(6) Metabolism Optimization 60 caps. Take 2 capsules upon waking before first meal or 30 minutes before exercise. Take 2 capsules upon waking before first meal. Taking the formulation before training supports the physiological processes of fat tissue loss. The supplement is recommended to people with disturbed glucose and / or lipid management. High Performance Nutrition was created to provide athletes and hard training individuals alike with the means to increase their performance without having to worry about safety or legality of their products. Every HPN product is formulated in accordance within the latest scientific research, and every step from raw material sourcing, to manufacturing, and finally finished product testing is taken with the utmost care to ensure that users receive nothing less then the safest and most effective products possible. Anthocyanins are a group of vegetable dyes belonging to the flavonoids, taking the colour depending on the pH of the cell sap from red to purple. A rich source of anthocyanins are aronia berries, blueberries, raspberries and cranberries. They are powerful antioxidants catching oxygen free radicals. They have important health benefits due to the anti-inflammatory properties (e.g. Cranberries prevent urinary tract infections), strengthen the immunity of the body (e.g. eyesight), prevent sticking together of platelets (so called aggregation), destroy cancer cells. Used in the prevention of the heart and circulatory system diseases (e.g. Chokeberry lowers blood pressure, slows the deposition of atherosclerotic plaques, lowers LDL cholesterol). Dyes are colouring additives, absorbing light and resistant to changes in temperature, for food products and supplements. Due to the ease of oxidation, products containing anthocyanins must be stored in containers that hinder the access of oxygen and at low temperatures. In supplementation, except of fresh fruits, dried fruits are used, in the form of infusions. Purple corn extract, also called blue corn extract, has been known and used for thousand years in Peruvian Andes to which it is native. It has a similar taste to the commonly known yellow corn, but it has much more nutritional value and health benefits. Because of its purple colour derived from the content of anthocyanins, it is a good source of antioxidants, namely compounds which remove excess free radicals from the body. Studies have shown that corn contains C3G (cyanidin 3-O-glucoside), one of the strongest antioxidants which may prevent obesity and diabetes. It has been demonstrated that it may help reduce inflammation and total cholesterol levels in the body. According to scientists, other potential effects of enriching a diet with kernels of this plant are a decrease in blood pressure and pulse rate. Furthermore, its antioxidant properties can prevent hardening of the glomeruli in the kidney (glomerulosclerosis). Apart from C3G, purple corn contains also other antioxidants, such as lutein and zeaxanthin. Their presence reduces the risk of eye diseases, e.g. cataracta.